Mr. Math Shows How He Uses the iPad as an Overhead Projector! Wouldn’t it be grand if you could find an app that allows you to skip between your presentation, a whiteboard or the web all in one while projecting all your movements seamlessly? That is what PowerPresenter claims to do. However, the results are mixed. First of all, although it says that it supports different formats, it really will only let you upload PDFs. Which means that any powerpoint, keynote, word presentations you might have you have to first convert to PDF. 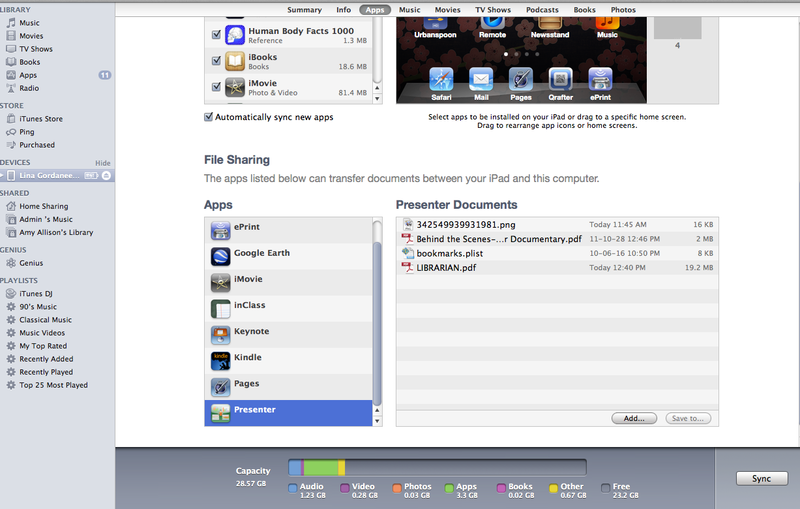 As well, the only way you can upload a document to powerpresenter is by syncing them through itunes. You can’t take a document you created on your ipad (let’s say via keynote) and upload to the app, which I find a huge flaw. 1. 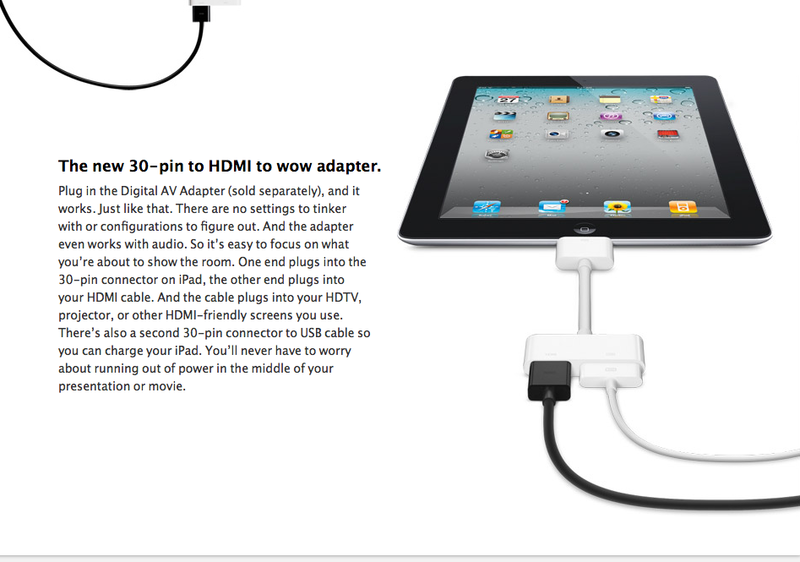 Plug your ipad into your computer. 2. 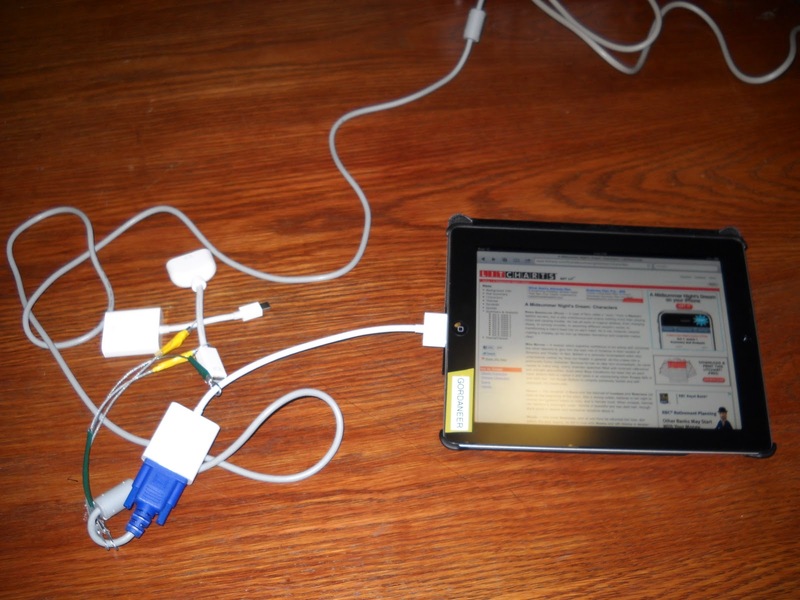 Click on devices–> your ipad. 3. Click the Apps Tab. 4. Scroll down and click on the app you want to share your file with. Your document should be in Presenter now. Now all you have to do is select that document and your presentation will be displayed. However, if you write on a slide and then move to the next one, your notes will be lost. 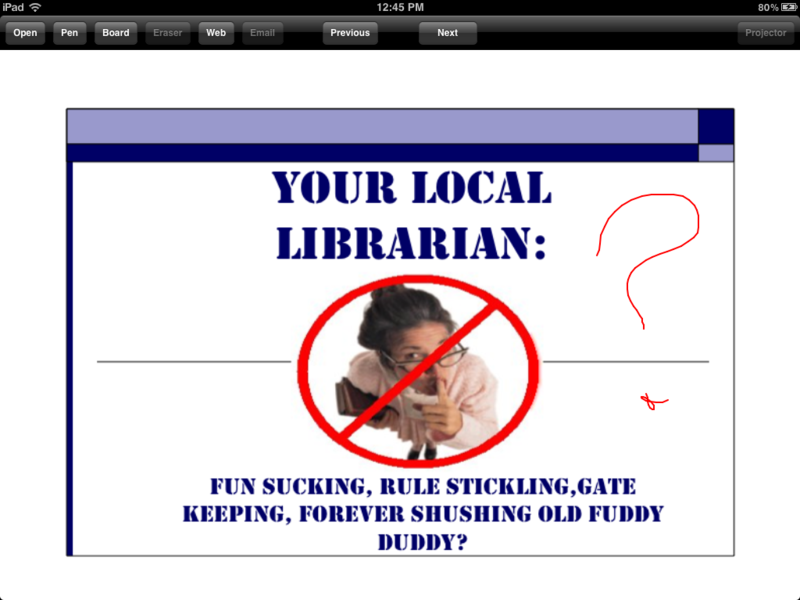 Also, you don’t have the ability to erase on your slides, only on the whiteboard. You can switch to white board mode easily enough, but once again, if you switch back, your white board notes will be lost. 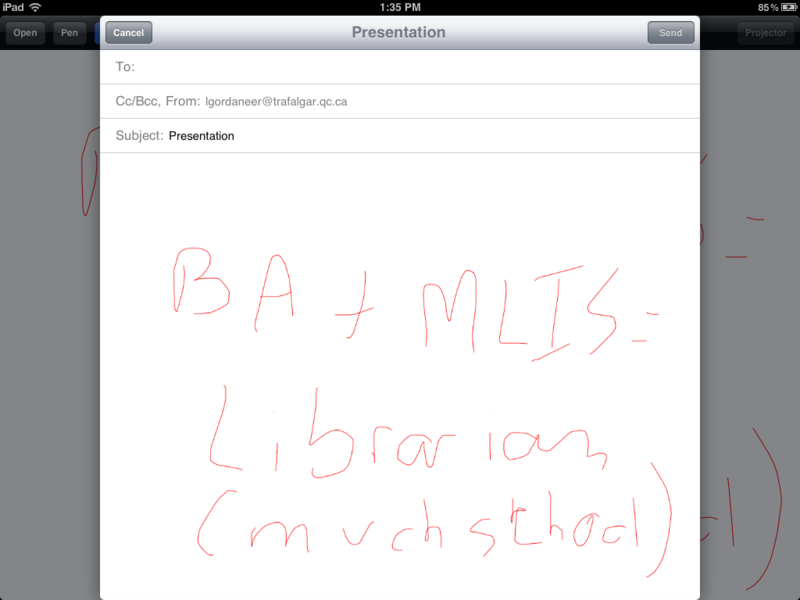 You can even email your notes to yourself, but it looks like you have to do it one image at a time. Again, not so useful. Essentially, this is keynote, safari and a white board App such as Showme rolled into one yet without some of the essential features of each. A selling point might be the fact that you can surf between your presentation, your whiteboard and the net with the capacity to project seamlessly. 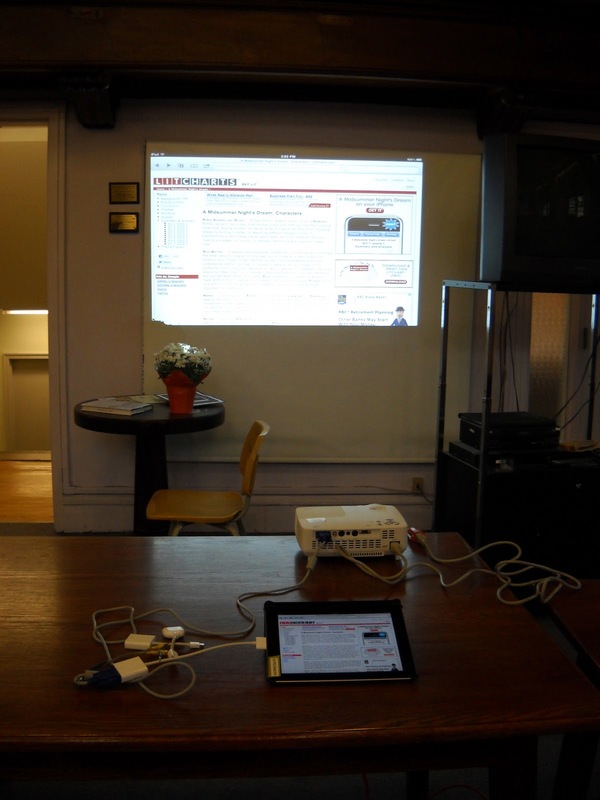 However, I have not been able to try it as the projector is in use today. (and I’m kind of lazy). Still for 1.99$ it could have its uses. 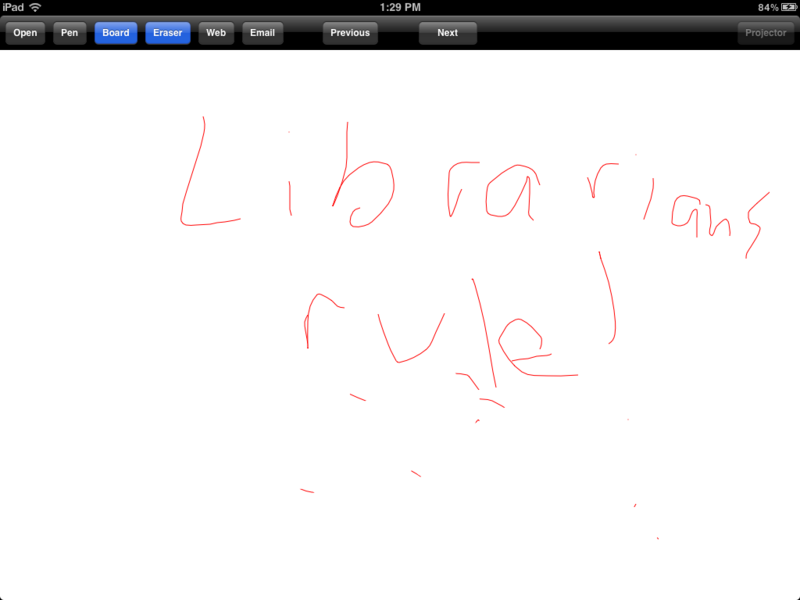 Oh, and if you want to avoid writing as bad as mine, I would recommend the use of a stylus. If you have found a better app for this kind of thing let me know and I will feature it in my rAPPido review section!